Scott Marlowe | Amazon Kindle: Now, is the price right? Scott, are you fairly confident they'll drop the prices yet again around holidays? I'm thinking of getting one around the holidays as well. What is your personal recommendation? Should I go with the Kindle or the Kindle DX? 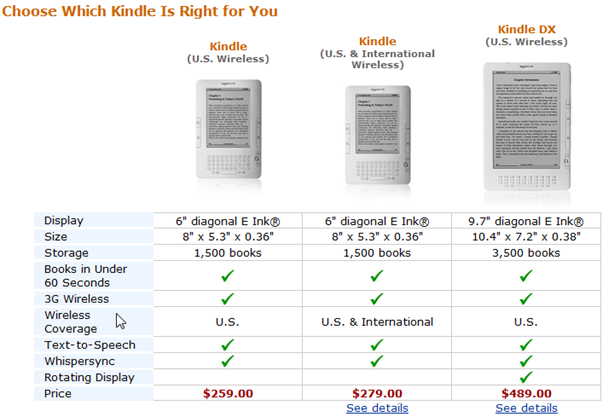 Is it really worth an extra $200 for the Kindle DX in your opinion? Honestly, on the price cuts, I have no idea. [b]But[/b], I think what they will do is gauge sales as we get into the holidays and if they're not where they want them to be, then I would expect another price cut. This season also differs from last in that Sony and now B&N have come out with competing e-readers, which should help drive prices down, if not in the short term then definitely in the long term. I'm also looking at getting one closer to Christmas (or for Christmas). I'll be watching prices to see if anything happens. The biggest difference between the regular and DX models is the screen size. Personally, I don't think the DX price tag makes it worthwhile, but then I'm not really an early adopter or a gadget freak. They came out with the DX model to accommodate digital newspapers and magazines. If you think you'll primarily be reading regular ol' books, I don't know if the DX makes sense or not. I don't think weight is an issue, but it is bigger. You might want to take a look at this article from PCWorld. It gives a nice breakdown of the current e-book readers as well as what's heading our way in 2010.